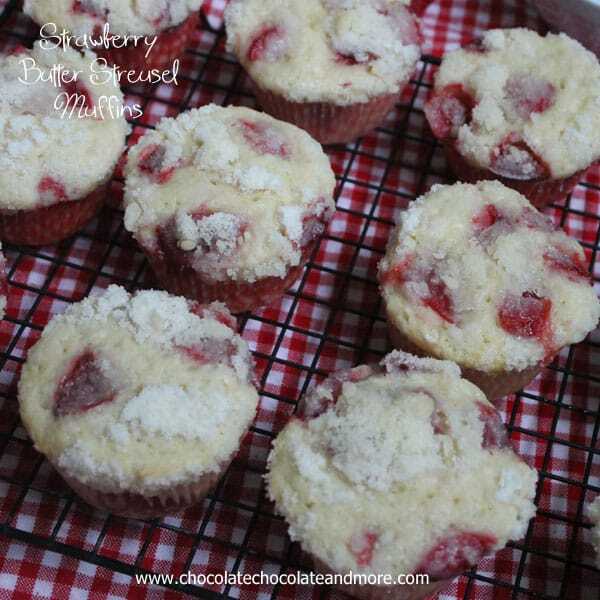 Strawberry Butter Streusel Muffins - Chocolate Chocolate and More! It’s a Boy! A beautiful, healthy, baby boy! No, it’s not mine. This new miracle belongs to my sweet friend Stephanie of Back for Seconds. I’m so happy for her and this newest addition to her family. Just like any new mama, that precious new bundle becomes the center of attention. Friends and family drop by. If it happens, like it does here in the south, no one shows up empty handed. Possibly, a gift for the baby, but always there’s food in hand. No one wants to spend time in the kitchen when there’s a baby to love on and adore. I know I never did. Everyone still needs to eat. Casseroles, soups, cakes, cookies. Always something for everyone. I’ve always been partial to supplying the sweet side of things. I decided, if this were a real shower, I want to bring something versatile, something everyone could enjoy. Something that could be saved for later if needed, even frozen. 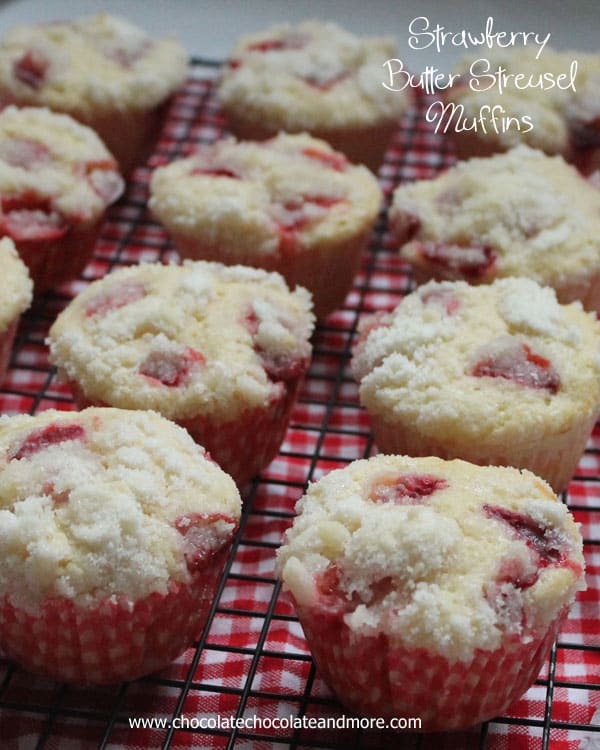 These Strawberry Butter Streusel Muffins met all the requirements. Great for breakfast or a snack. Sweet but not too sweet. The streusel on top give these the best butter taste in every bite. And of course the strawberries. You just have to love a strawberry muffin. At least in my house you do, so good! Make your streusel first. In a food processor, or with a pastry blender combine all ingredients until crumbly. Set aside. In a medium bowl, beat eggs, then add milk and beat again. While beating, add butter and vanilla. Pour wet ingredients into your flour mixture and mix with a fork just until all combined. 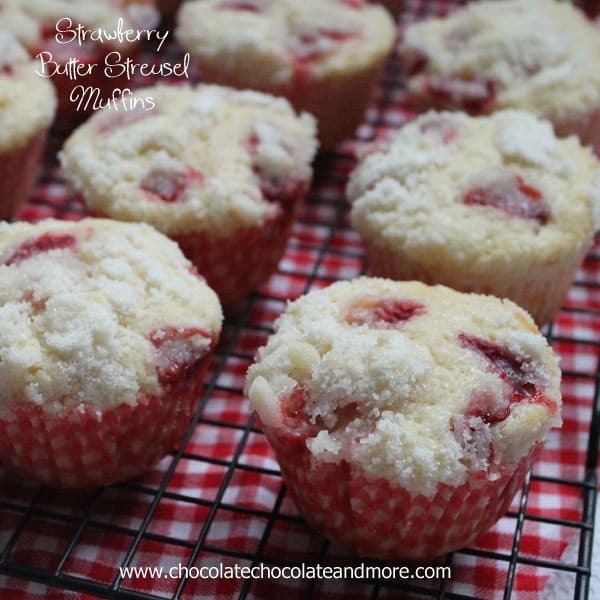 Spoon a tablespoon of batter into paper lined muffin tin, add a few strawberry pieces then another tablespoon of batter, being sure to only fill cups about 2/3 full. Top with a 4-5 more strawberry pieces. Top with about 2 teaspoons of streusel mixture. Bake in a preheated 350 degree oven for 25-30 minutes, until toothpick inserted in center comes out clean. Let muffins rest for 10 minutes before removing to racks to cool completely or serve warm. 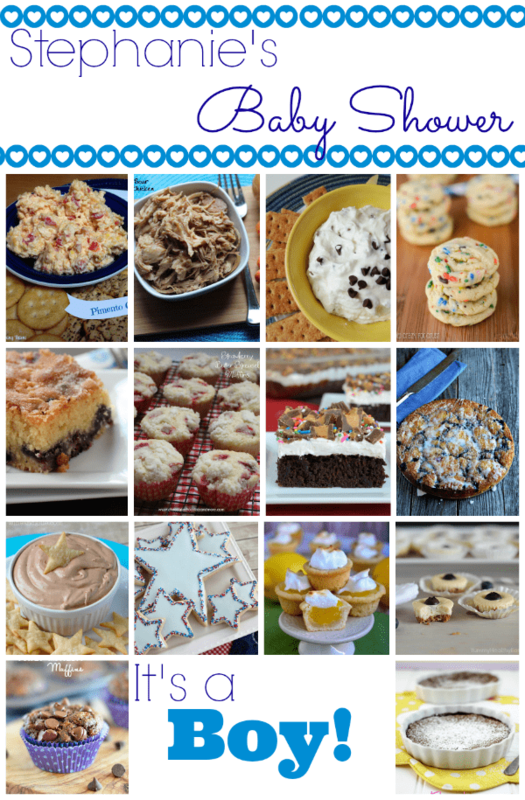 Be sure to pop over to Stephanie’s site or find her on Facebook then check out all the great food some other bloggers wanted to share to help welcome her home and her new addition! Seriously how gorgeous are these muffins? I nearly fainted from the beauty! Oh my goodness Joan! These muffins look fantastic! I love strawberries in my muffins 🙂 Pinned! 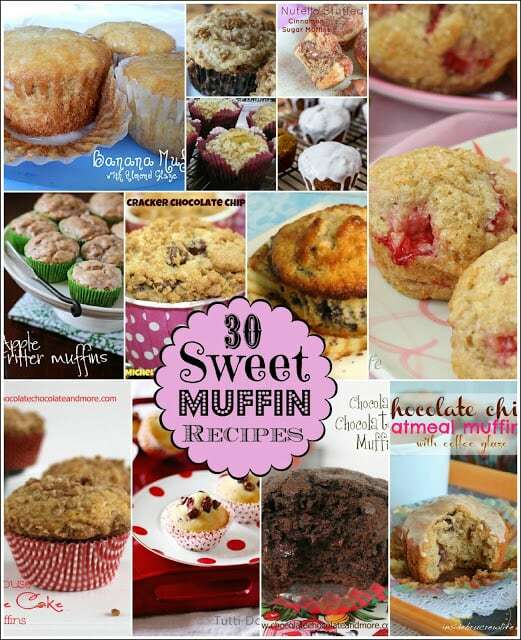 I am salivating over these muffins! Everything is better with streusel…and strawberries! These looks fresh and delicious! 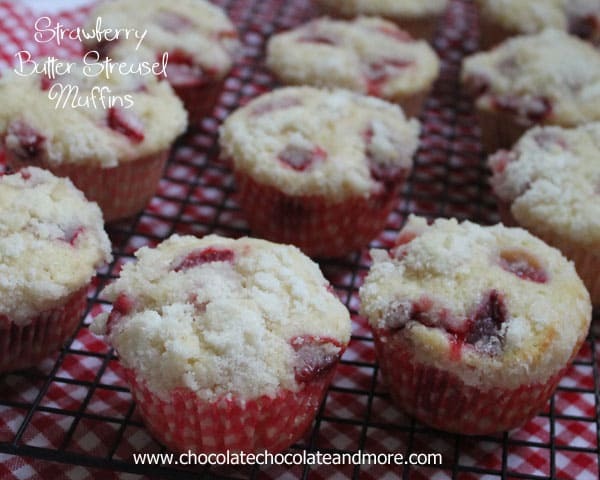 I honestly don’t know if I’ve ever had a strawberry muffin – I must have, but I know for sure I’ve never made them. I will, though – they look delicious! Pinning! These look SO good Joan!! Thanks for coming to the shower! These look SO good! Now I have to go out and buy some strawberries. How many muffins does this recipe make? We have a strawberry farm just down the street and they grow the most amazingly sweet strawberries ever! I can’t wait for them to open so I can make these! Joan I am totally over the moon for these muffins!! They look like the best breakfast ever! 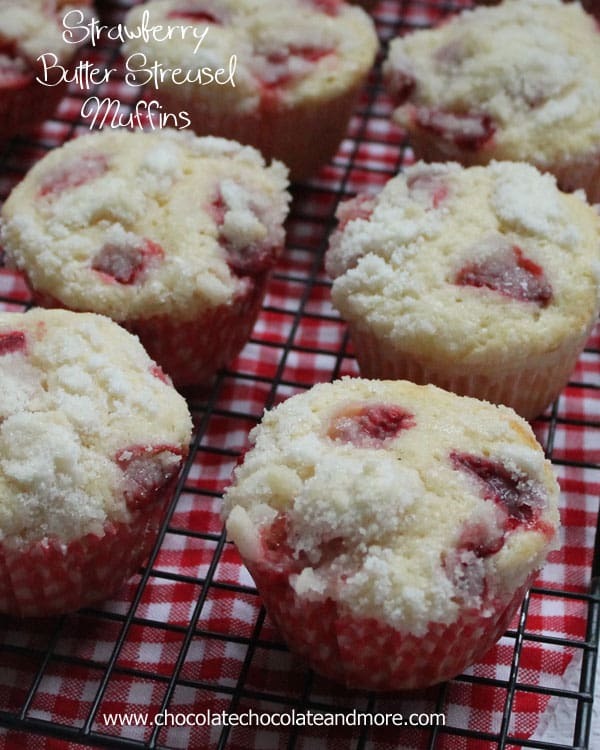 Strawberry muffins are delicious! And I love that you can freeze these too! What an absolutely delicious looking muffin! 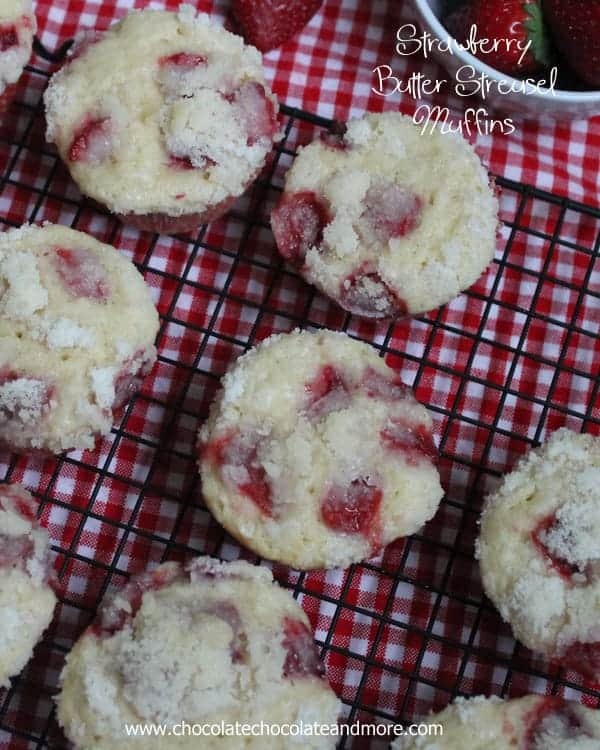 I love the bright pops of strawberry under the streusel topping! I’m sure these wouldn’t last long around my kids!!! Hello! I just made these, assuming it was for a batch of 12 regular size. Was it supposed to be enough batter for 24? I have lots of left over streusel. Can’t wait to taste them! Thanks! The recipe will make 12-14 muffins, you want to go heavy on the streusel but if you have some leftover, it keeps well in the fridge for up to 2 weeks and you could us it on top of a baked french toast or any other favorite fruit muffin. Yes, you can definitely use frozen fruit. Let the fruit thaw, drain it then gently pat dry with a paper towel. I am wondering, what will happen if I just mix in the strawberries with the batter? Your muffins will still taste delicious but depending on how juicy your strawberries are, they may run a bit and smear your batter with the juice.